Monitors: (1) Attendant to stay with the unit while in use. You may use your own attendant, or book an attendant with us. 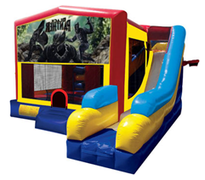 Bring your party from ordinary to extraordinary with a Bounce Combo! This Jumper rental provides over 400 sq. ft. of inflatable fun! It also features large netted vent windows to keep things cool, while allowing parents to keep a watchful eye on activities inside. 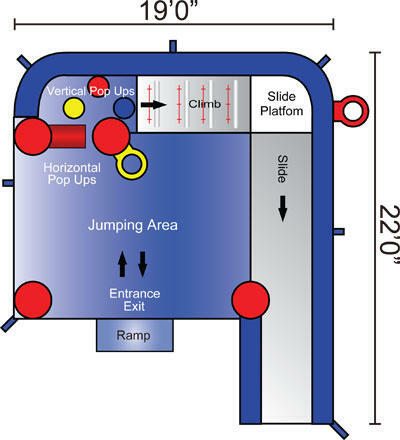 There's an inflatable ramp at the entrance for safe entries and exits. Go from jumping, to climbing, and finally zooming down the slide all in one unit! Setup: Please specify when you book this item if you will be setting up Indoors or Outdoors. If outdoors we would need to know specifically if it will be on grass or apshalt a minimum of 5 days prior to your booking. All anchors need to be secured using a spike or sandbag according the manufacture guidelines. We prefer to use ground stakes when possible, if this is not an option we will need to anchor using sandbags, again please let us know. 2. Must be set up on a flat surface. We cannot setup under any utility lines and must have a clearance of 5 feet in all directions away from any obstacles.